Knowing the symptoms of a concussion and some simple first aid can help people respond to a head injury quickly, reducing the chances of complications. Head injuries range from a bump on the head to a skull fracture. Some head injuries are severe enough to cause brain damage or even death. A head injury may present different symptoms. There are a range of head injury types, and the injury can be more or less severe within each category. A traumatic brain injury (TBI) happens when the brain is damaged, usually because of an accident. A person may have a TBI if an object hits their head, or if an object penetrates the brain through the skull. Some examples include a ball hitting the head at high speed, falling from a great height onto the head, or having a gunshot wound. Violent shaking of the head can also cause a TBI, as the brain can bounce or twist in the skull. These cases are often related to whiplash. A TBI damages the brain, usually causing a blood clot or bruising. A blood clot in the brain is known as an intracranial hematoma (ICH). An ICH can be more or less severe depending on its size and location in the brain. A concussion is a form of TBI that temporarily stops the brain from functioning normally. Symptoms of a concussion are not always serious or long-lasting but may cause complications. The skull is made of very hard, thick bone designed to protect the brain from injuries. However, it is possible to break or fracture the skull with a hard impact. If the skull breaks and the bone or another object punctures the brain, a doctor will refer to the injury as an open head injury or penetrating head injury. A head injury may present different symptoms depending on its severity. 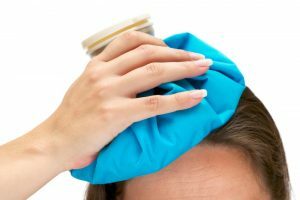 A bump to the head is a common injury that does not usually cause serious problems. However, there is no clear point at which a doctor will class damage as a head injury. It is usually possible to treat head injuries with mild or no symptoms at home. However, it is vital to know about the signs of a concussion and see a doctor if these develop. Moderate and severe head injuries require immediate treatment. If the symptoms of a mild head injury last for more than 2 weeks, a person should also seek medical advice. The symptoms of a concussion do not always appear immediately. Sometimes, a person may develop initial symptoms days or weeks after the injury. People should always take head injuries seriously. If someone is concerned about their symptoms, even after a mild injury, they should speak to a doctor. How do doctors diagnose a concussion? A doctor will ask how the injury happened and about a person’s medical history. They will also look carefully at the head, face, and neck. Concussions can often cause mental confusion. A doctor may ask questions or do tests to check a person’s memory, concentration, or problem-solving ability. If a head injury is moderate or severe, it may be necessary to do a brain scan. A cold pack can help to reduce swelling. People can often treat mild head injuries at home. Applying a cold pack to the area can help to reduce swelling. A person can also take Tylenol but should avoid non-steroidal anti-inflammatory drugs (NSAIDs), such as ibuprofen and aspirin, unless a doctor prescribes them. In the first 24 hours after a mild head injury, a person should ask someone to check on them regularly. If a person loses consciousness or shows signs of confusion or memory loss, it is vital to see a doctor. A person should avoid using drugs or alcohol, driving, or playing contact sports after a head injury. They may need to take time off work or school. Severe head injuries require immediate medical attention. Anyone who sees someone with symptoms of a severe head injury should call 911 or their local emergency number. It is best not to move a person with a severe head injury to avoid making their injuries worse. People should also not attempt to remove a person’s helmet if they are wearing one. Severe head injuries often require a stay in the hospital, surgery, or long-term treatment. A head injury can have lasting consequences, so it is essential to take precautions when necessary.